In Understanding Segments Types for Filtering, the types of segmentation were reviewed with strategies and use cases, such as system fields and audiences. 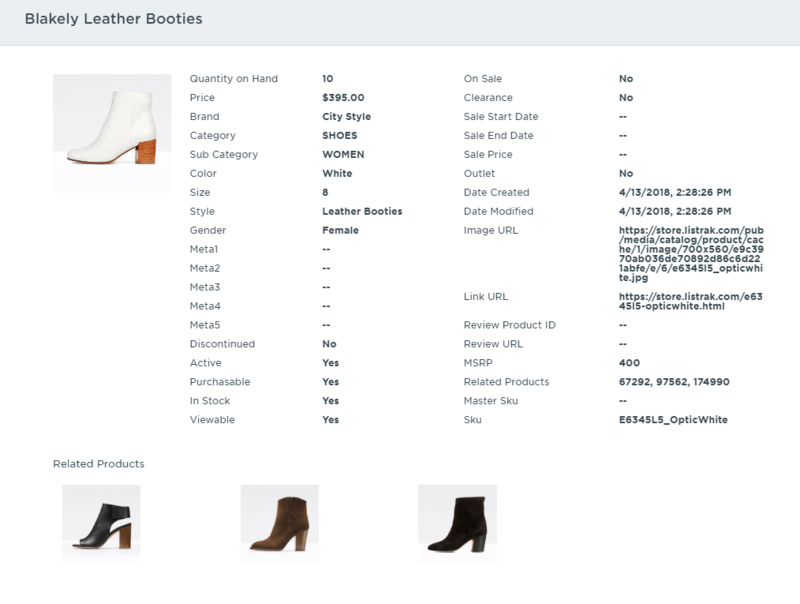 Contact behavior allows you to segment your list based on the items that a customer has purchased. Segmenting based on purchases requires two types of information: information on the order (such as order total), and information on the specific products purchased (such as SKU). The information about a customer's order is sent to Listrak via your integration. Some integrations provide this information automatically and some require you to send over additional files. View Listrak's Product and Data Summary to learn more about the information that you're sending Listrak and how to optimize this. Follow the below steps to access the Product Summary. 2. Go to Data Summary. 3. Click Product Information on the left-hand side. TIP: If you have multiple merchants, select the applicable merchant from the drop-down menu in the upper left-hand corner. Click the name of a product to open a more detailed view of all of the information Listrak has collected about the product. This information can then be used in the contact behavior segmentation, as well as to support solutions, such as Recommendations. Click here to learn more about optimizing your product catalog. The information in the product summary can be customized to reflect your product catalog. The five meta fields can hold any value that is available to send to Listrak. These values can be used in Listrak solutions and segmentation. After order and product information has processed into the Listrak Platform, begin building filters with this data. 1. Navigate from the home menu to an applicable place to filter. 3. Select Contact Behavior from the Segment Type drop-down menu. 4. Select Purchase History from the second drop-down menu. 5. Select your base order-level filter. NOTE: If you have multiple merchants, please select a domain before selecting your order-level filter. 6. Add additional items using the Add Option drop-down under Additional Options. 7. Select the field from Product Summary from the Add Option drop-down menu. 9. Specify the applicable values. In the above filter, the list is narrowed down to those contacts who have purchased from this particular merchant. 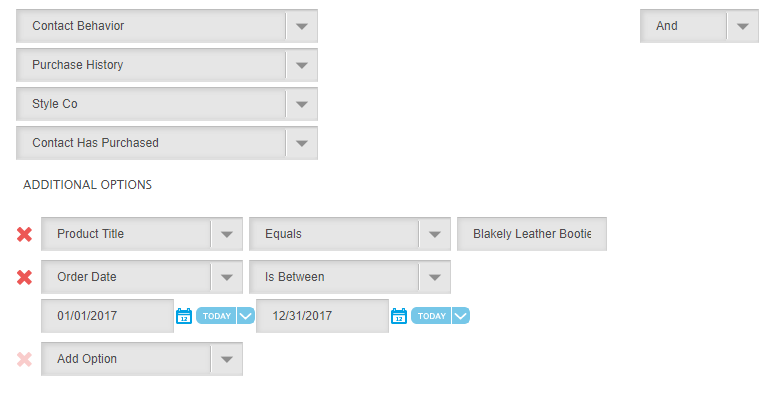 The contact must have purchased the Blakely Leather Booties product in 2017. Anyone who does not fit this filter is excluded. You can add additional options to continue to narrow the filter or use the And/Or operators to combine multiple filters. Click here to learn more about using operators to combine multiple filters.